I read the first two books in this series last year, and I really enjoyed them. Unlike some readers, who couldn't take to Henry, I did, and I was really rooting for him and Kate as a couple. The ending of Goddess Interrupted, which ends on a cliffhanger when we find out that Kate is pregnant and being betrayed to Cronus and Calliope by Ava, who she thought was her best friend, left me reeling and I was really looking forward to picking up The Goddess Inheritance. Kate is being held prisoner on the island where the original six have Cronus trapped. Henry or her mother don't know anything has happened to her, or about her pregnancy, as Ava's been telling them that they're still in Africa where Kate and Ava where supposed to be heading to locate Rhea, also a Titan and mother of Henry, and maybe their only hope to stop Cronus. Kate is in her ninth month of pregnancy when Ava finally goes and confesses to Henry about what happened to Kate, and he immediately goes to her rescue. But Calliope, goddess of marriage and fertility, who made Kate get pregnant, now makes her go into labour early, and takes the baby. Cronus tells Kate he'll make sure the baby is safe if she'll stay with him and become his queen for eternity when he takes over the world, as he plans to escape the island at the winter solstice, if not, he'll kill the humans and the gods and destroy the world. Kate leaves with Henry, and Cronus begins the war by wiping out Athens. Henry and Kate have had their fair share of relationship problems in previous books but I was always behind them. In this book, I felt they were a much more united front, and Henry's love for Kate is undeniable, having been doubted before. This book ended, almost, perfectly for me. We do suffer a loss, and that was my only negative, but still, I could see why it was necessary. 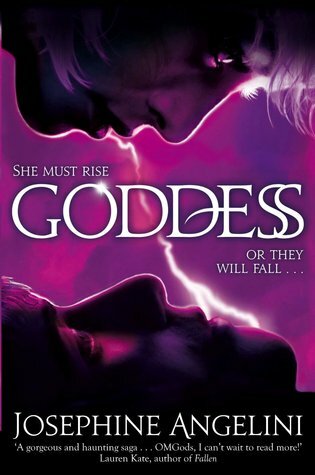 There's a hint given at the end of this book that this may not be the end of the Goddess Test series. I would of course, give any more books a go, but hopefully they'd be good. Not just more books for the sake of prolonging the series unnecessarily, which in my opinion, rarely works. I'm glad this was such a satisfying conclusion for you, Suzanne! The reviews so far have been great, making me reconsider my decision not to go into this series. Henry sounds like a love interest I'd probably love. I'm really happy you enjoyed it Suzanne (even though I wasn't keen) I guess I just wanted that bit more for the finale. Great review hun. You know I could not make up my mind on this series as the first book got mixed reviews, but those who stuck with the series really loved it. I like to see that five stars up there. I guess maybe I should reconsider! I remember seeing the first book in this series when it first came out and wanting to read it. Of course I never got around to it. Glad to know that the overall series turned out to be a good one. Hopefully someday I'll get to read it. I only skimmed your review, because I haven't read this series, yet. I'm glad you enjoyed this book, and hopefully Aimee will continue with this series, since it seems to have a fan base. Great review! I have the first book of this series and have not read it yet. I really want to and was talking about it on twitter and a fellow writer mailed me her copy. So it's on my bookshelf. Hoping to get to it soon. I'm glad to see you like this series. I love myth so im excited about this. Wow, it seems like quite a lot went on between the first book and this one. I didn't like Henry or how the idea of the first book was executed and didn't bother reading on, but wow, I can't believe Kate became pregnant!